Relaxed Player in Life for health and happiness. It all starts with you! Travel down today’s road with a smile and relaxed mind and body. One of the greatest compliments you can receive is to be told that you are a relaxed player. Happiness, love, joy furthermore a smile, will let the world know you are in control of your life. Other people traveling on the road of life will respect you if they don’t perceive you as a threat. Dog and lions and cats too can smell fear on a person; I suspect there is still some parts of our primitive brain that can detect fear. A polite smile can let someone know when they are off-base. Most of the small insults and indignations that we perceive are unintended. Don’t play games with other people who might be ignorant of your perceptions. Sometimes it is best to stop an antagonist in his tracks and politely tell him/her that you are offended. Soft words do indeed turn away wrath; like soft music stills the breast of the savage beast. Ignore life’s little annoyances. Tension begins in our imagination and grows upon fears, anxieties, and frustrations. We need to take a relaxing breath and smile. Smiling will help us to relax. Our brain will get the message that the little annoyance is an innocent event that should not be permitted to use our energy. So, let’s smile. It’s amazing how a positive look will reflect on your inner attitude. Smiling also exercises the muscles in the face. It’s actually harder to smile than it is to frown. 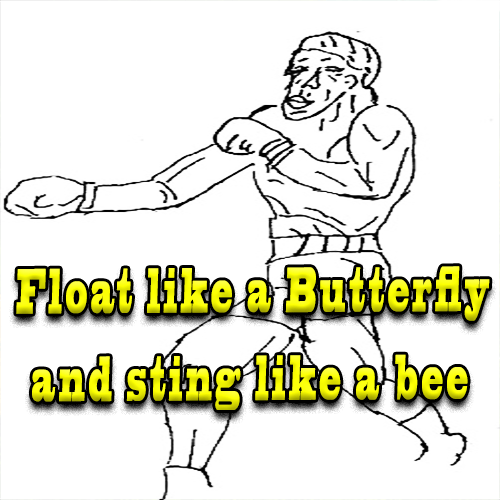 The great prize fighter, Muhammad Ali, said “Float like a butterfly and sting like a bee.” He had, what seemed like boundless energy. Perhaps he had all that energy because he didn’t let anyone steal it. Be a Relaxed Player In Life and the World Will Honor You with Happiness and Prosperity.